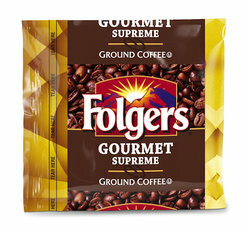 Folgers Gourmet Supreme Office Coffee is a Dark Roast. When we tried the samples in our office, we knew we had a winner. A rich full body, fantastic aroma with the ability to satisfy a wide range of pallets. We were pleasantly surprised that this coffee "cupped" as well as it did. A fantastic value coffee, 42 - 1.75 oz bags per case at a fantastic price. It's the Gold Standard in our Folgers line.